Baches employ a friendly and dynamic team of support staff to assist with the overall day to day running of the firm. We take pride in the fact that a lot of our support staff have been with us for all, or the majority, of their working careers. 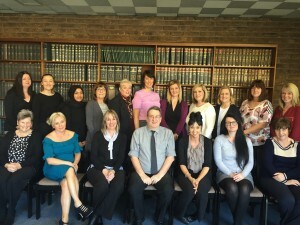 Baches employ a strong and dedicated team of secretaries, clerks, administrators, paralegals, trainee solicitors and receptionists whom are a valued asset to our firm. We are committed and pride ourselves in providing equal opportunities to all of our staff at Baches regardless of age, disability, race, sexual orientation, religion etc. Baches is a family orientated firm and enable all of our support staff to work flexible or part time hours to accommodate their child care commitments for their children and grandchildren.